Food Wishes Video Recipes: Chicken D’Arduini – Italian Home Cooking at its Best! Chicken D’Arduini – Italian Home Cooking at its Best! As promised, here is the chicken dish that my Uncle Bill served with the homemade fettuccine you saw him make a few days ago. This unbelievably flavorful recipe is a great example of the difference between home cooking and the way things are done in the professional kitchen. If I were to watch this video recipe clip, the first thing I would have wondered was why weren’t the chicken pieces browned first before being braised in the wine. This would have been my former professional chef brain talking. In the restaurant we always brown off the chicken to give it a bit more color. But, at home, with a recipe this jam-packed with flavor, why bother? It would have taken an extra half hour to brown all those legs and thighs and we had wine to drink and stories to tell. So, in true home cooking style we just added the raw chicken to that amazing oil, garlic and anchovy base (as you’ll soon see) and went from there. If you want a darker brown sauce and chicken, then by all means brown off the pieces first. We had better things to do. A few tips to keep in mind as you watch the recipe. Be sure NOT to brown the garlic. It was just simmered on low with the anchovies and olive oil for a few minutes before the chicken was added. As soon as the chicken and wine are added, and the pan is covered, there is no danger of the garlic burning. But, until those other ingredients go in, be careful! You should watch this clip a few times, to really see what happened. The heat was adjusted several times, and the wine went in at the beginning and the end. Basically the entire cooking time is about 45 minutes, half covered, half uncovered. At the end, once the chicken is starting to come off the bone, you are just reducing the sauce into a wonderfully sticky glaze. Uncle Bill threw in some olives and mushrooms near the end, but you could just as easily put in peppers, artichoke hearts, etc. This is a very easy recipe to tailor to you own tastes. The basic foundation is the chicken, wine, vinegar, garlic and anchovies. After that anything goes. And, because someone will ask, no, you can’t use chicken breasts instead…this is strictly dark meat territory. Enjoy! any vdo for the pasta sauce? yes, i will be doing one, stay tuned. Awesome recipe! What brand of olive oil do u use?? Oooh, that looks SO good. I will have to try it! not sure of the exact brand he used, but any light flavored olive oil will work. Nothing to heavy or extra extra virgin. you have a point. most "chefs" would advise to add at the end, but i have a feeling if I asked him why he would say "because that's when I add it"
Sometimes we assume that basil should ALWAYS have that fresh green aromatic flavor you get when adding at the end. But, it may be that the basil in this dish is better "cooked in" and more subtle and sweeter verses fresh and more pungent. Never worry about questioning anything you see or hear on this blog. It makes for fun debates and since no one can prove what is the "best" way to do something it really doesnt matter. Thanks. "Never worry about questioning anything you see or hear on this blog." Which is why I love this blog so much! Maybe we should start a culinary revolution of adding basil both in the beginning and then fresh at the very end to get both benefits? 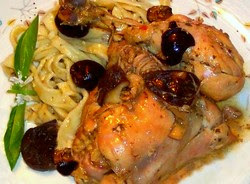 The recipe looks delicious -- Have you or your uncle ever made it with rabbit? No, but he's done it with goat. LOL, i just found an old rabbit demo I did, and was going to post that today! Hey, Chef John. You said you cooked the chicken on low until it was almost cooked after you took the lid off. About how long was that? It looks lovely. Can't wait to try it. Hi, instead of the red wine and vinegar, can I sub red0-wine vinegar? We don't drink and I would hate to buy a whole bottle of wine for half a cup. Thanks! I wanna try this tomorrow! well there's two additions, so its more like a cup. But, you can use a little more vinegar, and some water or stock. All vinegar may be too strong. I just finished making this and wow, GREAT DISH! I had a bottle of wine that I wanted to cook with and this worked so well. I went off the recipe and increased the all the spices and herbs then finished with the left over parsley. I found it funny how it started to smell like filipino chicken adobo which i guess could be the addition of vinegar. Thanks again for the demo. Delicious! Absolutely delicious! Chef, this one is a winner and your video instructions were spot on. Thank you!!! I love your blog BTW. Its a pleasure to read a blog from a 'real' chef who without all the stuffy jargon and lingo from a professional chef. feel like we can really make somehthing wonderful! What do u do if u dislike the taste of dark meat? Some may not realize but dark meat definitely has its own flavour that tastes disgusting to some(like me). I rather spit it out then eat it. Do you think this dish work well with white wine? After simmering the dish for 30 minutes, the instruction told us to continue cooking uncovered, but for how long? Do we turn the heat to high right after the chickens were tossed? just until cooked through, cant really give a time (and dont remember), just play it by ear. You can use high heat, unless it;s getting too reduce, then reduce the heat. Tried this tonight with chicken drummy's; I like it! We'll have to see what the boys think... Love your site; it's brilliant! zomfg. This dish is ridiculously delicious!!!! This is one of the best chicken dishes i've made. Thanks a lot Chef John! I've discovered your website a couple of months ago and I've been making a lot of the recipes. This recipe, combined with the homemade fettuccine and the olive oil sauce, is absolutely exceptional. Please keep posting new recipes. I've still got over four years of recipes to catch up on. Man, I use to think that I hated anchovies but that was back in the day when I use to attempt to eat it as is rather than simply cook with it. Nevertheless the one detriment to cooking with anchovies I have found, is that any leftovers have a loud fishy odor. A newbie here. Can you explain which ingredients/method/whatever-I-was-missing responsible for keeping the chicken pieces tender? I was under assumption that cooking chicken for that long would drain all the juices (overcooking). Thanks for taking your time to read my silly question. Hi Chef: From the looks of the cooking vessels used by your homies, it appears that they suffer collectively from agoraphobia, h'yuk h'yuk. Great to see another side of the best blogger in the 'sphere.